A compressor pedal is one of those effects that everyone knows they need, but they’re kind of at a loss to explain exactly what it does. 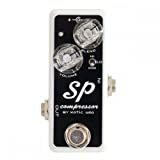 As the name implies, a compressor compresses the incoming signal from the guitar so that all notes played will be at nearly the same volume regardless of the strength of the pick attack. This will help to even out tones that sometimes get lost in the mix, and results in a more articulate sound. This is particularly useful to the metal guitarist whose attack will often varies based on the speed and complexity of the piece being played. In metal, a compressor is most often used to amplify quiet sounds rather than quiet loud sounds. This clip below provides an excellent demonstration of how a compressor can be used and how it sounds at a variety of different settings – I highly recommend giving it a watch. In this article, we'll help you to choose the right compressor pedal for your pedalboard. We've picked the best five compressor pedal based on some specific criterias. 1. WHY DO I NEED A COMPRESSOR PEDAL? 3. HOW TO GET THE MOST OUT OF THE PEDAL? No matter how accomplished a guitarist you are, the volume of the signal emanating from your guitar is going to vary wildly based on your attack. Sometimes this is desirable, but often times it is not. Performers like Stevie Ray Vaughan and Zakk Wilde who are very aggressive in their style of play are very familiar with this phenomenon. The problem becomes even more acute with the high-output active pickups favored by metal guitarists. It comes with the territory. That’s why almost all guitarists, regardless of genre, will benefit from the inclusion of a compressor in their signal chain. A compressor will even out those volume swings and make the transition less jarring for the listener. With decent compressors available in just about every price range, there’s really no excuse not to own one! There are a number of great compressors on the market, and the price range runs from relatively inexpensive (~$30) to over $200, usually – but not always – based on the number features offered. At the very least, the compressor you choose should have “attack” and “sustain (release)” controls. ATTACK controls the amount of time between a signal being over the threshold and when compression is applied. Under normal circumstances, you’d want to set this knob to make this interval as short as possible, but setting it for a longer lag time allows you to add more expression to your playing by reproducing an aggressive (or light) pick attack before kicking in. This would be ideal for clean leads or genres like blues or jazz, where such expression is necessary to the overall feel of the piece. SUSTAIN, sometimes referred to as release, is the overall time of the effect. As a note dies off, compression can actually kill the natural sustain of the note; therefore, you want to set a limit to how long the effect lasts. For chunky rhythm parts with a lot of muting, this isn’t particularly important, but when passages require notes to ring for a long time after being struck, it does become an issue. Although a compressor affects both loud and quiet sounds equally, using a compressor that also features a “limiter” can help you have more control over the effect by setting a limit to how loud a signal can go, evening out things even further. You will also sometimes see compressors labeled as compressor/sustainer. This isn’t really an added feature so much as an emphasis by the manufacturer on the amount of control provided over the amount of sustain the effect allows. Some compressors also have a blend control. This is a nice feature that allows you to mix your original signal with your compressed signal which tends to fatten things up. Often you will find the perfect level of compression only to realize that some of the body and dynamics of the signal are lost. With a blend control, you can add some of that back into the signal without loss of the compression effect. There is much debate about where the compressor fits best in the signal chain. Some advocate putting at the very beginning right after the tuner and wah because it sends a nice balanced signal to the rest of the effects so that the response is more predictable. Others insist that it should be placed at the end to boost the overall signal before being sent to the preamp. Unfortunately, any noise or hiss introduced by the other effects will be boosted as well resulting in some unwanted frequencies. This could be remedied by placing a noise gate just before the compressor in the chain, but that would mean adding another effect into the mix and could potentially negatively impact the tone as well. When dealing with effects loops, it’s always better to keep things simple. In terms of the best settings to use, it will really have a lot to do with what style of music you play. Let's check out 4 Pedalboard Orders to learn how to put compressor pedal in your signal chain. For a heavy, driving sound, having the volume and/or gain control, tone and sustain or release turned all the way up usually produces the best results. For blues or jazz, the volume and/or gain should be turned way down at the 10 o’clock position or lower, the tone at about 50% (12 o’clock position) and the attack and sustain somewhere above 50% depending upon what kind of response you are looking for. For clean sounds, all of the controls should be turned down below 50%, and the blend control, if available can be adjusted to add just the right amount of unmodified signal. The HyperGravity features a multiband dynamics algorithm that is the same MD3 compression algorithm that can be found in tc electronic’s studio production compressor. As if that wasn’t enough, you can use the free TonePrint app to beam custom-tweaked compression tones directly to the pedal. With controls for Sustain, Level, Attack and Blend, along with the TC Electronic reputation for high-quality gear, this compressor would already rate high on our list, but add the TonePrint vintage switch for a classic vintage stompbox compression tone and a good effect becomes a great one. 4 controls for precise settings of Sustain, Level, Attack and Blend. Vintage compression mode for classic “squishy” compression. Choice between either true or buffered bypass. TonePrint app allows user to customize their own tones or choose from a number of pre-configured tones and beam them directly to the pedal. Vintage mode tones can be muddy and dark. Transient artifacts can show up in tones edited through TonePrint giving the effect a “digital” sound. The CS-3 Compression Sustainer pedal compresses louder signals while boosting lower signals. The BOSS CS model compressor has been around in various incarnations since the CS-1 way back in the 1970s and although the circuitry has been updated and improved, the CS-3 is still one of the better known and respected compressors on the market. Compresses signal without affecting articulation of notes. Transparent compression does not artificially color tone. Excellent sustain – good for metal, especially for clean solos. Can be noisy, particularly in long effects chain. 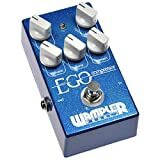 Wampler has been around for over a decade now, but is still considered to be a boutique brand. The Ego compressor is highly respected and used by superstars like Brad Paisley and Neal Schon, two guys who really know their gear. Blend control for sustain only with no noticeable effect on the attack of the note (great for playing with distortion). Clean “twangy” compressed sound not a good fit for metal. With less than 10 years in the stomp box business, Xotic Effects is a relative newcomer, but they’ve wasted very little time in proving they belong up there with the big boys. I broke my own rule here because the Xotic Effects SP doesn’t have an Attack or Sustain knob, just a Volume and Blend. In this case, however, the sound quality is so good that they aren’t necessary. Like many other compressors, it’s based on the legendary Ross compressor of the 70's. The blend knob is the real game changer here, so that even though the hi, lo and mid compression give the effect little in the way of fine tuning the attack and sustain, the sensitivity of the blend knob it such that by mixing just enough of the original tone into compressed signal, it will give you exactly what you need. Based on Ross compressor, the “Holy Grail” of compressor pedals. Does not affect the dynamics of the input signal. Unique blend control with ultra-high sensitivity and up to +15dB of boost. True bypass means absolutely noiseless when switched off. No controls for sustain and attack. Keeley advertises this pedal as having the sound quality of expensive rackmount or tube equipment in a stompbox package. It does have a great amount of versatility for a compressor pedal and can be used just as effectively for a bass as it can for a guitar. In fact, the Clipping control controls input sensitivity and can be used in the studio to run keyboards, drum machines, drum mics, even master recordings and other line-level uses. It works just as well for classic rock as it does for country, blues and jazz. It can even be employed for a good clean metal sound. Very versatile. Can be used as a traditional stompbox compressor for guitar or bass or as a studio effect for drums, keyboards or in mastering. Attack control designed to be equally effective with both passive and active pickups. Good for those that often switch live between single coils and humbuckers. Physical design of the enclosure, color and knob style can vary leading to confusion as to whether this is the correct product. The TC Electronic HyperGravity edges out the Keeley 4 Knob. While the overall versatility of the Keeley is nice, it’s unfair to use its other possible applications as a basis for comparison since the decision making criteria for this review is restricted to its use as a compression pedal. It’s hard to argue that purely as a compressor it’s hard to beat the TonePrint’s ability to edit and transfer custom tones to the pedal. I hope you enjoyed this review and rating and would love to hear your input. Feel free to leave your comments, and always remember to keep rocking! I have a big obsession with guitar shredding, big fan of progressive stuffs: Dream Theater, Opeth, Children of Bodom... Come here as Guests but Stay as Family with us - ShredAddict.com! Best Distortion Pedal: Metalhead Buying Guide for 2018 & Beyond! Wanna buy the Best Looper Pedal? Stick with these 5 Factors! ShredAddict.com is a participant in the Amazon Services LLC Associates Program, an affiliate advertising program designed to provide a means for sites to earn advertising fees by advertising and linking to Amazon.com. Additionally, ShredAddict.com participates in various other affiliate programs, and we sometimes get a commission through purchases made through our links.